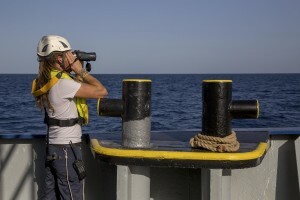 AT SEA, UNSPECIFIED – NOVEMBER 5: Sea-Watch crew member patrol the sea during training activities in the Mediterranean sea on November 5, 2017. Sea-Watch is a non-governmental organisation founded on May, 19 2015 and is formally registered as a non-profit organisation in Berlin. 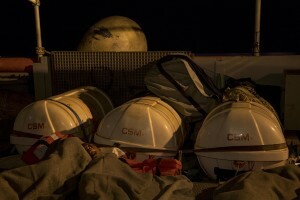 Sea-Watch crew member are seen during training activities to simulate a migrants rescue operation in the Mediterranean sea on November 4, 2017. Sea-Watch is a non-governmental organisation founded on May, 19 2015 and is formally registered as a non-profit organisation in Berlin. A general view of Mediterranean sea on November 2, 2017. 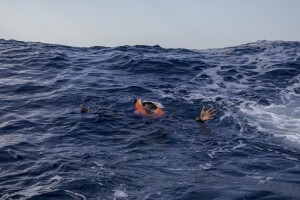 A Sea-Watch crew member looking for rubber dinghy with migrants on board during a rescue operation in the Mediterranean sea on November 6, 2017. Sea-Watch is a non-governmental organisation founded on May, 19 2015 and is formally registered as a non-profit organisation in Berlin. 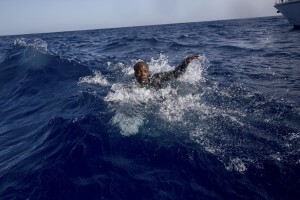 A migrant tries to board a boat of the German NGO Sea-Watch in the Mediterranean Sea on November 6, 2017. 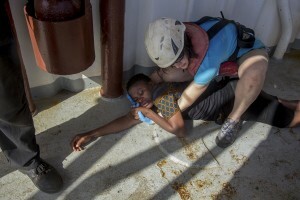 During a shipwreck, five people died, including a newborn child. 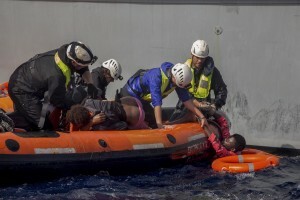 According to the German NGO Sea-Watch, which has saved 58 migrants, the violent behavior of the Libyan coast guard caused the death of five persons. 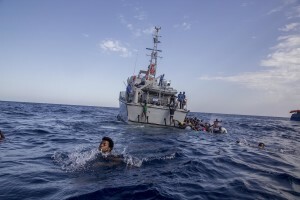 Some migrants swim towards the rescue boats of the German NGO Sea-Watch after having escaped from the Libyan Coast Guard ship in the Mediterranean Sea on November 6, 2017. 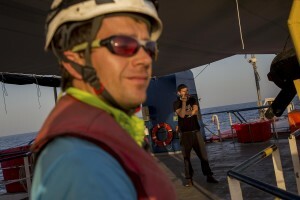 During a shipwreck, five people died, including a newborn child. 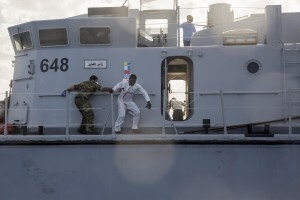 According to the German NGO Sea-Watch, which has saved 58 migrants, the violent behavior of the Libyan coast guard caused the death of five persons. 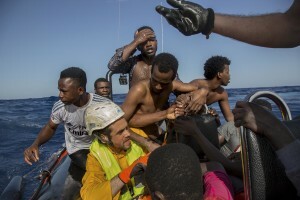 Migrants are rescued by members of German NGO Sea-Watch in the Mediterranean Sea on November 6, 2017. 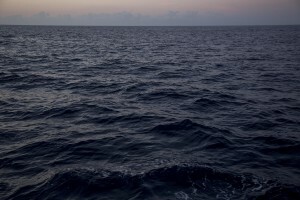 During a shipwreck, five people died, including a newborn child. 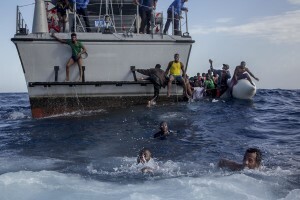 According to the German NGO Sea-Watch, which has saved 58 migrants, the violent behavior of the Libyan coast guard caused the death of five persons. 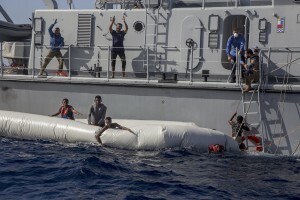 The Libyan Coast Guard tries to recover migrants from a rubber dinghy in the Mediterranean Sea on November 6, 2017. 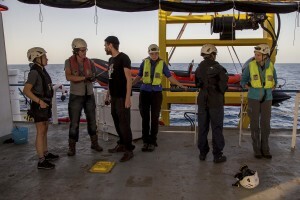 During a shipwreck, five people died, including a newborn child. 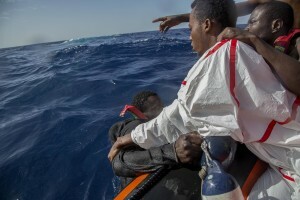 According to the German NGO Sea-Watch, which has saved 58 migrants, the violent behavior of the Libyan coast guard caused the death of five persons. 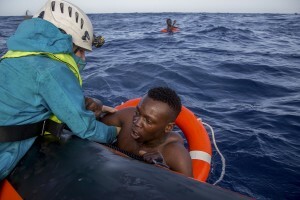 The Libyan Coast Guard tries to recover migrants from a rubber dinghy and invites violently and threateningly the German NGO Sea-Watch – who was performing rescue operations – to go away in the Mediterranean Sea on November 6, 2017. 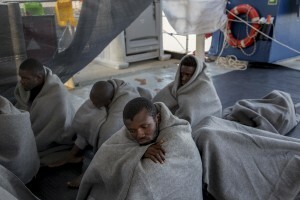 During a shipwreck, five people died, including a newborn child. 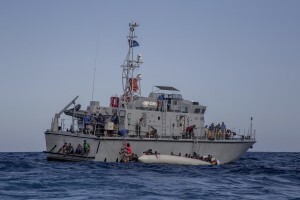 According to the German NGO Sea-Watch, which has saved 58 migrants, the violent behavior of the Libyan coast guard caused the death of five persons. 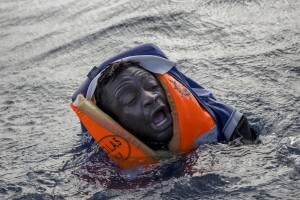 The corpse of a migrant is seen in the Mediterranean Sea on November 6, 2017. 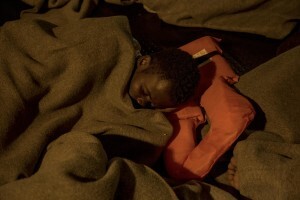 During a shipwreck, five people died, including a newborn child. 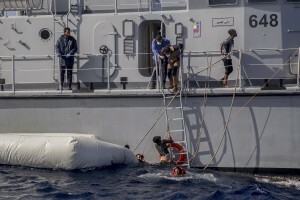 According to the German NGO Sea-Watch, which has saved 58 migrants, the violent behavior of the Libyan coast guard caused the death of five persons. 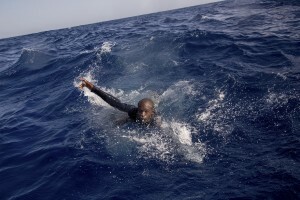 A migrant tries to escape from the Libyan Coast Guard ship after being rescued by them in the Mediterranean Sea on November 6, 2017. 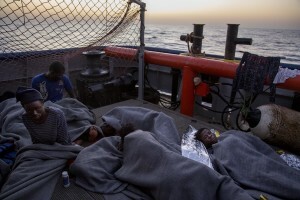 During a shipwreck, five people died, including a newborn child. 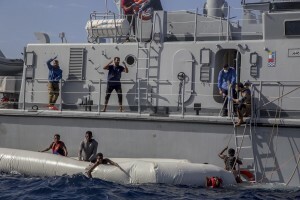 According to the German NGO Sea-Watch, which has saved 58 migrants, the violent behavior of the Libyan coast guard caused the death of five persons. 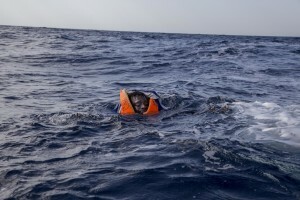 A rubber dinghy is seen in the Mediterranean Sea on November 6, 2017. 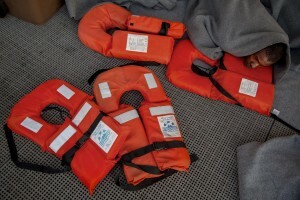 During a shipwreck, five people died, including a newborn child. 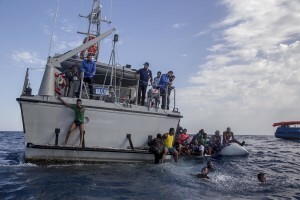 According to the German NGO Sea-Watch, which has saved 58 migrants, the violent behavior of the Libyan coast guard caused the death of five persons. 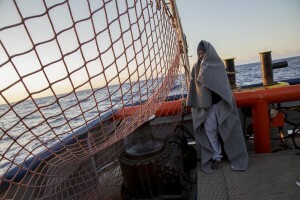 A woman is seen on board of German NGO Sea-Watch ship after her rescue in the Mediterranean Sea on November 6, 2017. 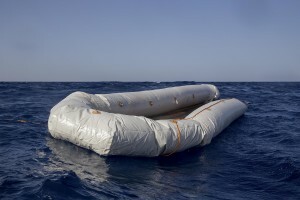 During a shipwreck, five people died, including a newborn child. 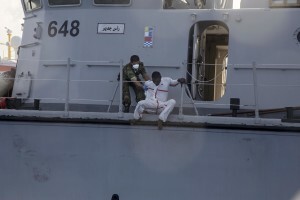 According to the German NGO Sea-Watch, which has saved 58 migrants, the violent behavior of the Libyan coast guard caused the death of five persons. 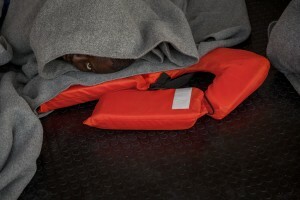 A woman rests inside the ship of German NGO Sea-Watch after her rescue in the Mediterranean Sea on November 6, 2017. 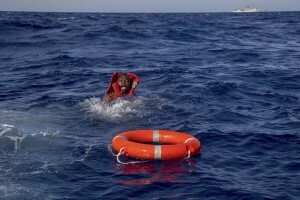 During a shipwreck, five people died, including a newborn child. 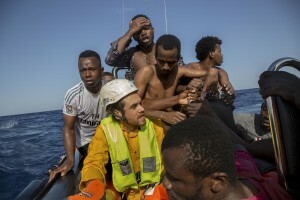 According to the German NGO Sea-Watch, which has saved 58 migrants, the violent behavior of the Libyan coast guard caused the death of five persons. 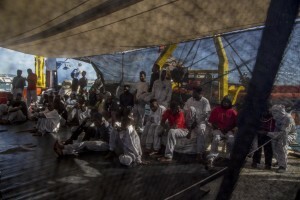 Migrants are seen on board of German NGO Sea-Watch ship after their rescue in the Mediterranean Sea on November 6, 2017. 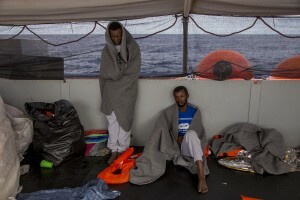 During the shipwreck November 6,2017 five people died, including a newborn child. 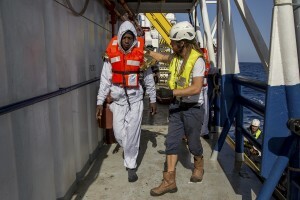 According to Sea-Watch, which has saved 58 migrants, the violent behavior of the Libyan coast guard caused the death of five persons. Sea-Watch is a non-governmental organisation founded on May, 19 2015 and is formally registered as a non-profit organisation in Berlin. 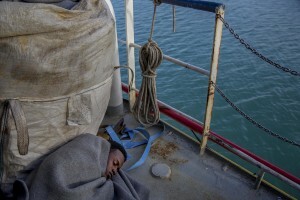 A migrant sleeps on board of German NGO Sea-Watch ship after his rescue in the Mediterranean Sea on November 6, 2017. 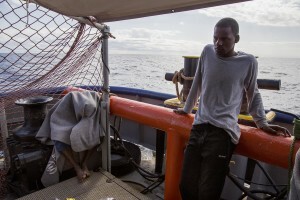 During the shipwreck November 6,2017 five people died, including a newborn child. 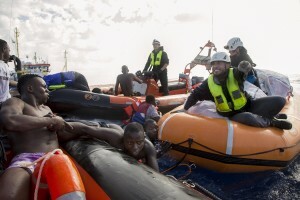 According to Sea-Watch, which has saved 58 migrants, the violent behavior of the Libyan coast guard caused the death of five persons. 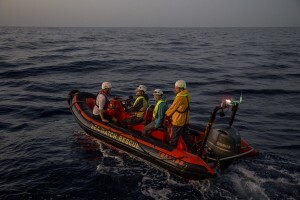 Sea-Watch is a non-governmental organisation founded on May, 19 2015 and is formally registered as a non-profit organisation in Berlin. 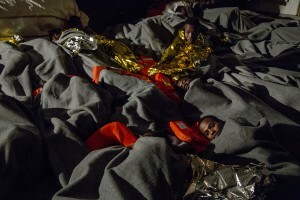 Migrants are seen on board of German NGO Sea-Watch ship after their rescue in the Mediterranean Sea on November 7, 2017. 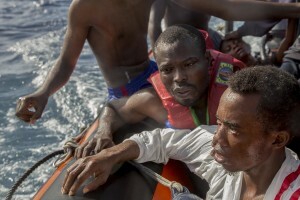 During the shipwreck November 6,2017 five people died, including a newborn child. 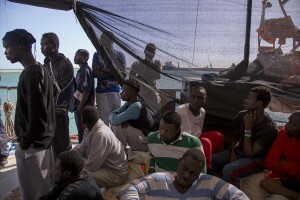 According to Sea-Watch, which has saved 58 migrants, the violent behavior of the Libyan coast guard caused the death of five persons. Sea-Watch is a non-governmental organisation founded on May, 19 2015 and is formally registered as a non-profit organisation in Berlin. 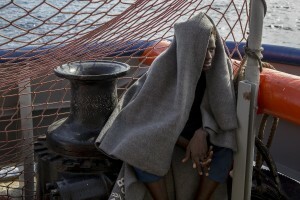 A migrant is seen on board of German NGO Sea-Watch ship after his rescue in the Mediterranean Sea on November 7, 2017. 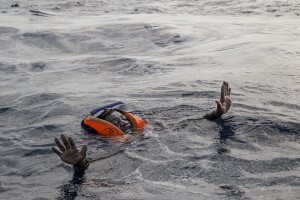 During the shipwreck November 6,2017 five people died, including a newborn child. 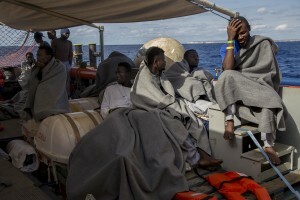 According to Sea-Watch, which has saved 58 migrants, the violent behavior of the Libyan coast guard caused the death of five persons. Sea-Watch is a non-governmental organisation founded on May, 19 2015 and is formally registered as a non-profit organisation in Berlin. 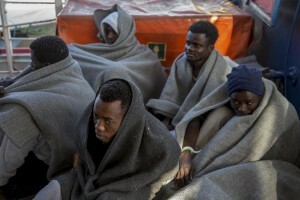 Migrants are seen on board of German NGO Sea-Watch ship after their rescue in the Mediterranean Sea on November 8, 2017. 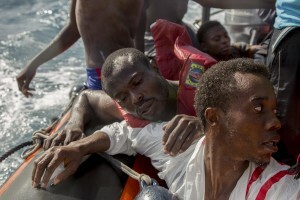 During the shipwreck November 6,2017 five people died, including a newborn child. 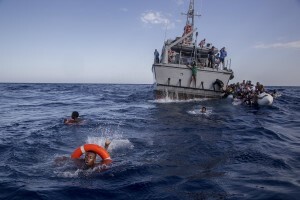 According to Sea-Watch, which has saved 58 migrants, the violent behavior of the Libyan coast guard caused the death of five persons. Sea-Watch is a non-governmental organisation founded on May, 19 2015 and is formally registered as a non-profit organisation in Berlin. 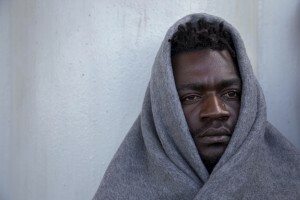 A migrant is seen on board of German NGO Sea-Watch ship after his rescue in the Mediterranean Sea on November 8, 2017. 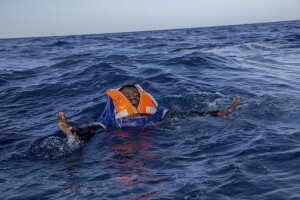 During the shipwreck November 6,2017 five people died, including a newborn child. 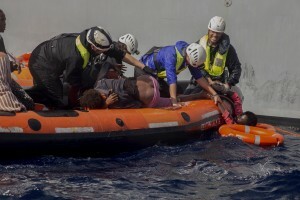 According to Sea-Watch, which has saved 58 migrants, the violent behavior of the Libyan coast guard caused the death of five persons. 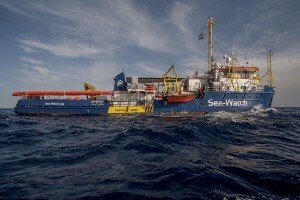 Sea-Watch is a non-governmental organisation founded on May, 19 2015 and is formally registered as a non-profit organisation in Berlin.